Quantifying behavior change is at the crux of almost every digital health solution on the market. In addition to fitness tracking, there are consumer apps that can track food intake, heart rate, sleep, and a host of other activities. 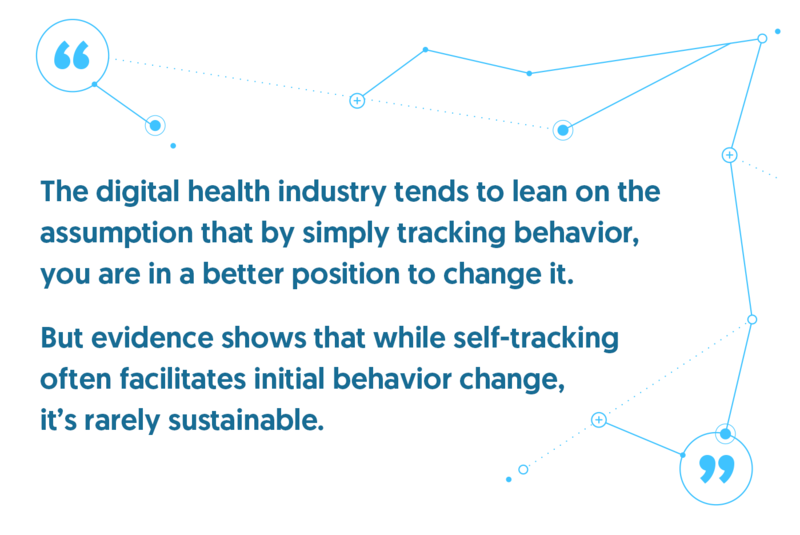 More often than not, the digital health industry tends to lean on the assumption that by simply tracking behavior, you are in a better position to change it. But evidence shows that while self-tracking often facilitates initial behavior change, it’s rarely sustainable. However, the digital health industry is now beginning to scratch the surface when it comes to leveraging data to create sustainable behavior change. While day-to-day behavioral data is a critical part to making a health program effective, the “in between” data offers a longitudinal lens to quantifying behavior change. In amassing data that quantifies those shifts, Omada’s data science team has made great strides in being able to drive more sustainable change. As an early adopter of the “outcomes-based” pricing model in digital health, Omada’s revenues for our preventive program are dependent on achieving results. For this reason, data must play a central role in our company - from how we work with clients to how we deliver the most effective, best-timed interventions to our participants. But as our data science team knows, how you analyze data is at least as important as how you collect it. Because we need to focus on sustainable behavior change, we need to dive even deeper into the data. The goal of our data science team is to support individualized “precision-prevention” tailored to each user. For example, we work to target participant notifications based on what we know (via hundreds of thousands of previous data points) will be most effective for a participant, and when. Our data helps us to make the program better for the next person. When a user logs an unhealthy meal, we've found that users who receive proactive coach outreach are more likely to lose weight than those users who don’t. We covered some of this in a piece a few years ago about how consumer companies like Netflix are influencing digital health. But the simple fact is that we know that participants respond to feedback is only one (small) part of the equation. To drive truly personalized prevention, we must also find ways to quantify, and increase the efficiency of, the type of feedback our coaches deliver. Our data science team leverages machine learning to suggest different feedback prompts to coaches based on whether a participant will respond to a “tough love” style or an “empathetic” one. Our system also understands that our participants aren’t static -- someone who responds to tough love in Week 4 may need empathy in Week 12. So precision-prevention demands a dynamic system that evolves with the needs of our participants. Our data-forward innovation approach helps us to understand our impact, and segmentation helps us to determine who might be doing better than others and who among our participants could benefit from more targeted coach intervention. By exploring and unpacking the in-between data, we’re able to work at the intersection of human intelligence and artificial intelligence to create sustainable behavior change. One of the most overused phrases one hears as a data scientist is ‘correlation doesn’t equal causation.’ But sometimes cliches carry deep truth, and this one does, especially when it comes to behavior change. Our team of data-science experts is consistently slicing our data, sometimes unearthing unexpected results. Often, these results lead to insights that can be used to improve our program. A simple example: almost every company in digital health seeks to generate more engagement with their program or platform, under the hypothesis that more engagement will inevitably lead to better health outcomes. However, our data shows sheer engagement quantity alone isn’t the key to outcomes; instead, it’s a combination of the consistency and quality of that engagement that matter at least as much. We call this meaningful engagement. Let’s compare two participants who each completed seven actions in the Omada program over the course of a week (actions include completing a lesson, conversing with a coach, interacting with another participant in their group, etc.). For consistency, let’s also say they completed the same seven actions, in the same order. A cursory look at this data would indicate that these participants are equally engaged, and should therefore achieve comparable results. But that’s not the case. Let’s look more deeply at this data. Many digital health companies define engagement in the broadest terms possible -- after all, it makes a presentation to a client or a prospect much easier with a larger headline number. But, the quality of engagement matters for outcomes; the consistency matters when you are working to build a sustainable habit. Meaningful engagement is not about how many times a participant logged their food - at least not alone. It is meaningful when participants build streaks to build habits, or when they get into a routine of taking an action at the same time every day. As a result, we take a holistic approach by analyzing all of the different ways a person might interact with the program and assigning scores to the impact that individual (or connected) activity has to a health outcome. Behavior change doesn’t happen overnight. It takes time. Quantifying behavior change from a longitudinal lens offers endless opportunity to create sustainable behavior change and create positive health outcomes that matter for our participants, our organizational customers, and our team. In the coming months, we’ll continue to dive deeper into how our team collects, analyzes, and utilizes data in this way.